“We must secure the existence of our people and a future for white children,” he said in an online video, ending the refrain with a big smile and his index finger pointing at the sky. The mantra was coined by a member of the neo-Nazi terror group The Order and has been used as an avowal by white supremacists ever since. Antifascist activists from Berkeley, California, posted the clip, which appears to have been taken from a livestreamed video in August to expose Foreman’s racist history. On Jan. 14, Foreman was back on video. This time, he was at Speaker Nancy Pelosi’s house in Napa County, California, taking part in a stunt put on by far-right activists Laura Loomer and Ben Bergquam. Loomer and Bergquam hopped over the wall to the property and set up a tent as part of a protest against illegal immigration. They received trespass warnings from the local sheriff’s office but were not arrested or cited, a sheriff’s spokesman said. Foreman was a minor figure in the event, remaining outside of the walled property and making just a few brief appearances on videos posted by the activists. But the incident highlights the winding path he has taken in the world of extremism. Just 28, Foreman has forged a number of alliances with hate figures and other extremists in the past two years. He has volunteered with the antigovernment Oath Keepers group. He has taken part in anti-immigrant protests with the extremist group Patriot Movement AZ (PMAZ). He marched beside white nationalists during the deadly 2017 “Unite the Right” rally in Charlottesville, Virginia. And he is one of only a handful of people who’ve been banned from returning to the University of Virginia campus for four years because of the rally. Foreman is often depicted as the muscle or bodyguard during various extremist events. But he has done more than just lurk in the background of these movements. He has often been an active player or even leader in one cause or another. And he has proven eager to be on the front lines if or when a battle begins. He put it succinctly in 2017 after he was shown on video walking into a Communist-affiliated Berkeley, California, bookstore and antagonizing its employees. Foreman was present for one of the seminal events in the contemporary white nationalist movement – the “Unite the Right” rally in Charlottesville, Virginia. He served as the bodyguard for Tim Gionet, also known by his online pseudonym “Baked Alaska,” who has similarly bounced around different movements, including the racist “alt-right.” Longtime white supremacist leader David Duke used Twitter to help Gionet raise money to travel to the event, but it’s unclear whether Gionet’s expenses included travel for Foreman as well. The Aug. 12, 2017, rally turned violent before it even began when, on the night before, white nationalists marched onto the University of Virginia campus, carrying Tiki torches and chanting, “Jews will not replace us.” They brawled with counterprotesters, and several participants from the white nationalist side were later brought up on federal rioting charges. At the official rally the next day, similar violence broke out. Law enforcement declared the event an illegal assembly and ordered it to be shut down. A black man was severely beaten in a parking garage by a group of white nationalists. And most notably, a neo-Nazi sympathizer plowed his car into a crowd of counterprotesters, injuring many and killing 32-year-old Heather Heyer. Foreman was side-by-side with the white nationalists for both the Tiki torch march and the next day’s rally. 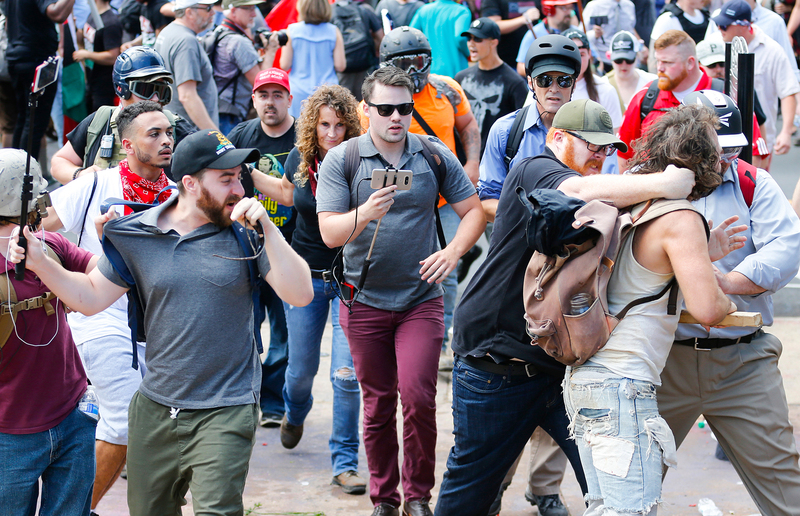 One Associated Press (AP) photo from the rally showed him with his arm around Gionet’s shoulders, shielding Gionet as violence broke out around them. A second AP photo showed Foreman with a closed fist at the back of someone’s neck as Gionet was nearby, with a cellphone perched atop a selfie stick. In one of Gionet’s livestreamed videos that night, Foreman was seen shoving a man — who at the time was an SPLC employee — after the man tried to knock Gionet’s ball cap off his head. The letter didn’t provide any details of the alleged assault, however, so it’s unclear whether the letter was referring to that incident. Foreman was banned from returning to the university for four years, the letter said. “You are being issued this trespass warning because you engaged in criminal activity on University property and your conduct threatened the health and safety of persons on University property,” it read. Similar letters were sent to other attendees of the Tiki torch march, according to the university. Among those also banned from the campus were racist alt-right leader Richard Spencer, four members of the white nationalist hate group Rise Above Movement (RAM) and a man who’s been involved in the neo-Nazi groups Atomwaffen Division and the Traditionalist Worker Party. The four RAM members were charged by federal authorities earlier in October with rioting and conspiracy to riot in part because of the events of that weekend. Undated photo from Foreman's Facebook page. The letter banning Foreman from returning to the University of Virginia listed his current home as being in Thousand Oaks, California, a city with just less than 130,000 people – 81 percent of whom are white. 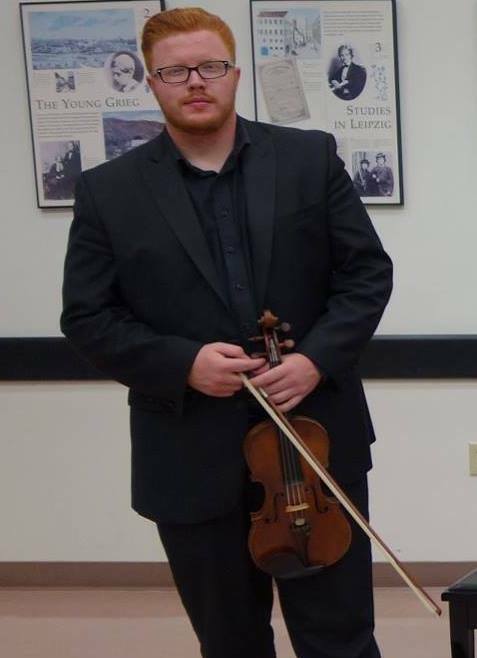 The city is also the home of California Lutheran University, where Foreman was a music major and violin soloist for the school symphony in 2014. During an October performance that year, the symphony played three pieces from “Schindler’s List,” the Academy Award-winning film about the Holocaust. Two-and-a-half years later, on April 27, 2017, Foreman was standing shoulder-to-shoulder in Berkeley, California, with the Oath Keepers, an antigovernment extremist group. The group was there for a “free speech” rally, which featured speakers like Proud Boys hate group founder Gavin McInnes, white nationalist Tim Gionet and Oath Keepers founder Stewart Rhodes. The rally remained peaceful, unlike some previous Berkeley rallies in which the far-right clashed with anti-fascist and other leftist activists. In a group photo the Oath Keepers later posted online, Foreman could be seen wearing a helmet and holding a riot shield bearing the Oath Keepers logo. Less than two months later, on June 17, 2017, authorities said Foreman got into a fight in a Santa Monica parking garage and was stabbed nine times. Foreman’s friends claimed the stabbing was politically motivated because of his support of President Donald Trump, but police disputed that. Law enforcement told the Los Angeles Times that Foreman “made a comment to the suspects which led to an argument.” A fistfight quickly broke out and two men allegedly stabbed Foreman and were arrested a short time later, police said. Friends of Antonio Foreman signed a get-well card while he was recovering from a stabbing. 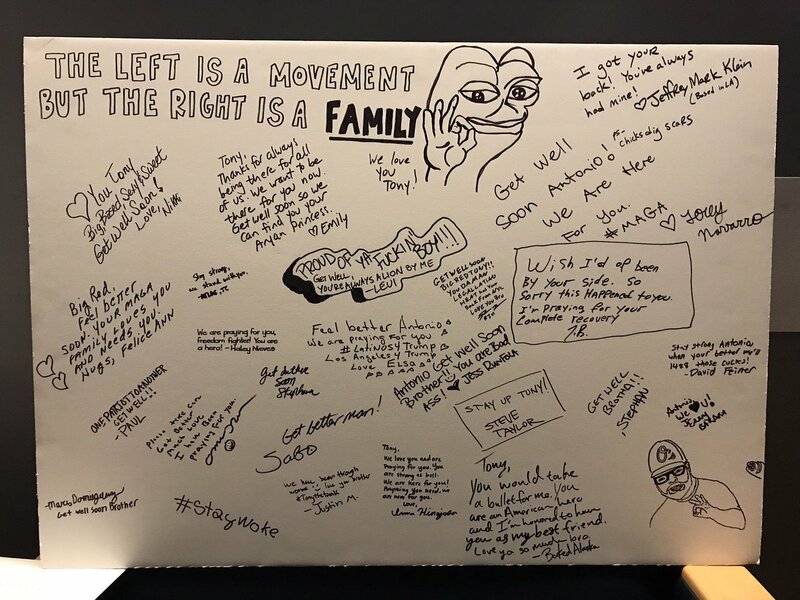 The photo of the card was posted to Twitter on June 21, 2017 by Southern California activist Omar Navarro. The photo Navarro posted on Twitter appears to be in that same hospital room where Foreman recited the “14 words.” And the video clip that was posted last year by anti-fascist activists shows many of the same trappings of the hospital room seen in Navarro’s June 21, 2017 photos, down to the “Come and Take It” gun flag hanging near the bed. The video appears to have been originally livestreamed by Gionet, whose white nationalist views are so toxic that he’s been banned from most major social media platforms, so the original source of the video is unknown. In the video, Gionet appeared to be responding to a viewer who asked him to recite the neo-Nazi mantra. “Someone wanted me to say the ’14 words,’ so of course – of course I’ll say the ‘14 words,’” Gionet said. As he began to recite the mantra, Foreman joined in. “So, I love 1476,” Foreman said. 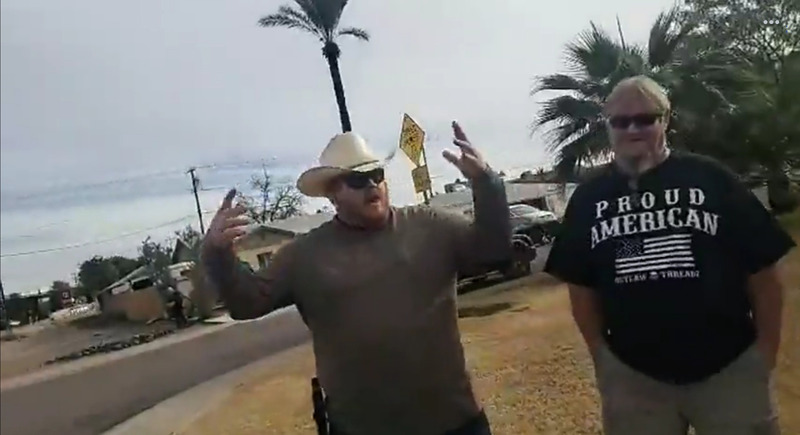 Antonio Foreman, left, is seen standing next to an unidentified man in a livestreamed video posted to Facebook on Jan. 5, 2019 by the extremist group Patriot Movement AZ. More recently, Foreman appeared at a far-right protest in yet another state: Arizona. The event was organized by Patriot Movement AZ (PMAZ), an anti-immigrant extremist group that has recently begun protesting at Phoenix churches where asylum seekers are being sheltered. The federal government has asked the churches to help the immigrants, who are in the country legally, as they begin the long process toward asylum. The churches provide food, clean clothes and toiletries, and let them stay for a day or two before they depart to be with friends or family members in other parts of the country. Some of the group’s videos have been viewed more than 400,000 times on Facebook. It was at one of these churches where Foreman may have put his “no more safe spaces” philosophy to the test again. On Jan. 5, Foreman showed up at a Phoenix church with another man from California, Jesse Macias, who goes by the names “Jesse Suave” and “Jess Right” on Facebook. Both were part of a group called United Patriot National Front, which participated in a militia-friendly event at Chicano Park in San Diego last year. Macias reached out to PMAZ three days prior in the comments of one of the group’s Facebook videos to suggest that he and “Tony” would show up to film the action. During the protest, Macias and Foreman were side-by-side with PMAZ at the Phoenix church as a Department of Homeland Security (DHS) bus dropped off asylum seekers. Macias helped operate the camera that was livestreaming video to PMAZ’s Facebook page. In the video, Macias could be seen walking onto the grounds of the church moments after the DHS bus pulled out of the parking lot. Members of PMAZ had been told to stay off the property in the past and were hanging back on the sidewalk, but one of the group’s leaders, Jennifer Harrison, encouraged Macias to go. Speaking Spanish, Macias heckled multiple people who were unloading a car. Then he turned and tucked tail when a woman walked toward him, telling him he was trespassing. Macias hustled out of the parking lot, still filming. At one point in the video, Foreman, wearing a white cowboy hat, could be seen in the distance, crossing the street. He was walking away from a different part of the church. The two men met up across the street, where other PMAZ supporters were standing. “They wanted to trespass me,” Macias said. “I got trespassed too,” Foreman said. “Did you ask for her name?” Macias asked. Foreman ignored the question and continued. It’s unclear if the scene went down the way Foreman said it did. He couldn’t be reached for comment for this article. Phoenix police spokesman Sgt. Armando Carbajal, meanwhile, said officers responded to calls from the church that day but interviewed no witnesses and wrote no reports. 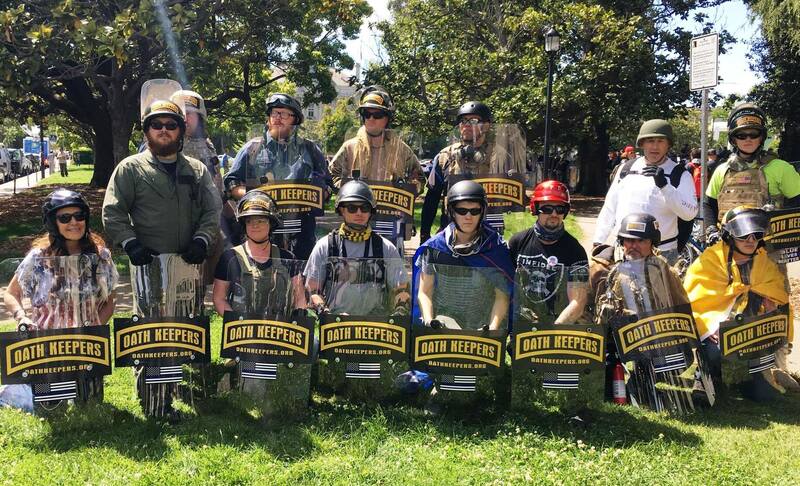 Antonio Foreman, back row, is seen holding an Oath Keepers shield in a photo posted by the group from an April 27, 2017 rally in Berkeley, California. If it did happen as Foreman said on video, however, it would be an echo of an incident at a Berkeley bookstore in 2017. In September of that year, the month following “Unite the Right,” far-right activists had begun targeting Revolution Books in Berkeley. The bookstore is affiliated with the Revolutionary Communist Party, and the people harassing it believed it to be some sort of enemy headquarters. Moments later, Foreman led a crew across the street and entered the bookstore. People in the store immediately swarmed his group and told them to leave. “Out! Get out!” the people in the store yelled back. Foreman did not budge, and eventually people inside attempted to push him out through the door. “This is discrimination!” one of Foreman’s friends yelled. Eventually, the people in the bookstore were successful in pushing Foreman and the rest out. They shut and locked the doors to the business. Outside on the sidewalk, Foreman was amped about what just took place. Harassment of the bookstore by the far right continued in the days that followed. Foreman took part in a several of those encounters, and at least twice had to be escorted out of the building by security guards. At Speaker Nancy Pelosi’s Napa County house last week, Foreman’s maroon Nissan Titan pickup truck could be seen parked across the street in some of the livestreamed videos posted online. Otherwise, he skulked mostly in the background and said very little. His “no more safe spaces” attitude, however, was at the heart of the stunt carried out by Laura Loomer and Ben Bergquam, which was done to make a point about building a wall along the nation’s southern border. Loomer went on Bergquam’s AM talk radio show on KGED in Fresno, California, afterward to mock the fact that law enforcement was called after they jumped over the wall and set up camp, albeit briefly, on Pelosi’s property. As of Thursday, Jan. 24, Bergquam’s video of their exploits, with Foreman lurking in and out of the frame, had been viewed more than 1.5 million times.